ACMA GD’S 2KF series of filling machines are available from Selpak . They have a high standard of hygiene, making them particularly suitable for microbiologically sensitive products like pharmaceuticals, milk, fresh juice, personal care products, and food. The use of self-lubricated and lubricated for life components reduces maintenance to a check-out operation. The design of the machine allows the operator to replace the main modules by direct access with a minimum number of tools. The main modules, like the weighing units, are removable without tools. The changeover from one bottle size to another can be completed in a few minutes without tools. It is accomplished by replacement of self-positioning and colour-coded parts. 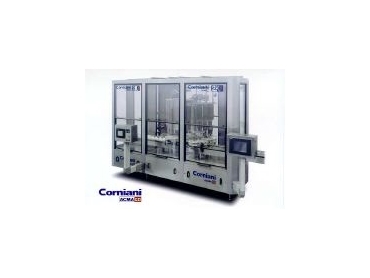 Height settings are electronically controlled by the product recipe management software. The Libra 32 operator interface is on a touch screen PC installed on a swing support. It allows to operate on the machine from the ideal position in any circumstance. The ACMA GD filler is a machine based on the principle of net weight. Each of the filling stations is based on an electronic scale linked to the central microprocessor which controls filling and weighing operations. The product is contained in a hygienic tank and is not subjected to any friction , compression or turbulence. All parts of the machine in contact with product are built in stainless steel 316 L, mirror polished. Each container processed by the machine is weighed before, during, and after completion of the filling cycle. Each of the stations independently operate a continuous weight detection during the filling cycle. They can detect the weight difference between an empty carrier and a carrier with bottle. This avoids avoid product spillage. The clean-in-place system available on ACMA GD machines has two high impact rotating spray balls fixed inside the tank. The system has been developed for the requirements of the dairy industry and can be used with acid, caustic solutions or disinfectant substances. A collecting tray is available with manual or automatic positioning under the filling nozzles. This enables the total draining of the cleaning liquids. These operations become particularly efficient thanks to the sloping-bottomed tank and a 100% self-draining surface. The change over for all ACMA GD fillers and cappers is tool free. Change parts are available with colour code or completely coloured.